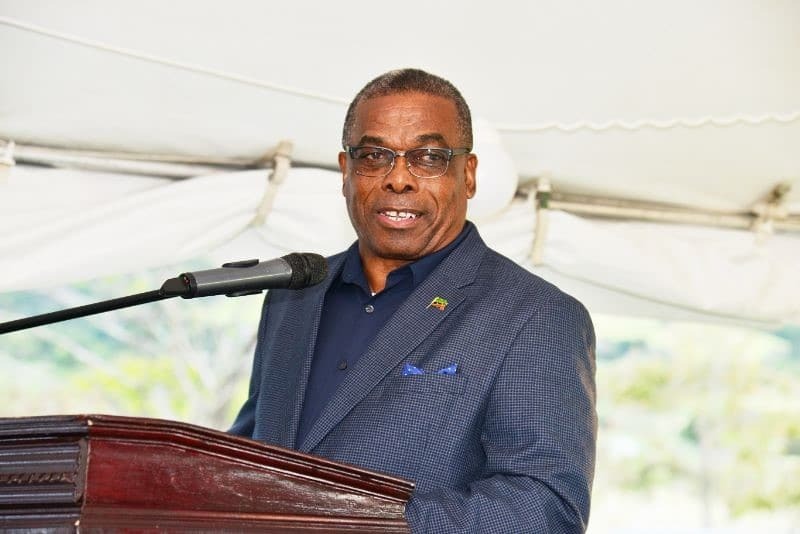 Basseterre, St. Kitts, March 15, 2019 (SKNIS): At the Official Contract Signing Ceremony for Phase 2 of the Island Main Road Rehabilitation and Upgrade Project held on March 14 in Cayon, Minister of Public Infrastructure, the Honourable Ian “Patches” Liburd, said that upon taking office he was given the task to create a proposal for a capital project to address the degrading state of the roads in the Federation. Phase Two will commence in Keys and will continue through Challengers via Saddlers and from the Airport round-about to the Camps round-about via Wellington Road through Cayon Street. “I want to thank God for the opportunity with which he has blessed me and the opportunity to help to rebuild this country and lest we forget my people, we cannot stop saying and repeating that we inherited a country with the infrastructure that was run down and dilapidated,” said Minister Liburd, adding that the justified capital expenditure is helping to modernize the Federation and ensure that persons’ vehicles do not continue to be damaged by potholes. “It wasn’t hard to justify the island main road rehabilitation because people damaged their vehicles from the constant potholes. Right around the island, when we would have completed this project, we will see the good markings, guardrails where necessary, widening of the roads where necessary, and the reflectors. These improvements will go right around the island and we will have a modern, international highway in this country,” added the Minister. He said that the addition of the traffic lights in Basseterre has also helped to modernize St. Kitts and that project will also have a phase two that will be coming on stream soon. Minister Liburd made mention of the Old Road Bay Project, which he said is now in progress. He noted that one of the mandates for the project was to have local input wherever necessary. He said that 45 local truckers are registered with the contractor who is also local and added that approximately 35 truckers have already been employed to transport materials from the local quarry to Old Road Bay. He also added that 25 employees have already been engaged to work on the project. “We introduced a model that said we must have local input and that is critical because when we have such local input, it cascades and trickles down into the economy faster. The grass root economy benefits,” he said. “I am honoured and humbled to be the captain of this team called public infrastructure. I want to thank my cabinet and the team from the public works department,” he said. Nine sub-contracts were signed by all local contractors at the ceremony which will facilitate the road work up to Saddlers Village. The work will include the relocation of water lines, sidewalks and drains. The contractors include Boonie’s Construction Company Ltd; Allie’s Construction; Anthony Huggins & Sons; I&B Limited (Trevor Isaac); John Boy Construction (Dwight Berry); Stephen’s Construction (Stanford Stephens), and T&G Construction (Troy Flanders).